Vouchers are not applicable to current reservations or with other discounts. Each Voucher can only be redeemed for consecutive nights. Reservation required, subject to availability; contact the Resort (209) 962-7690 for specific availability. Must reserve within one year of voucher purchase date or promotional value expires. Amount paid never expires. Must complete travel within one year of voucher purchase. Blackout dates – Vouchers cannot be used for reservations May 15 to August 15, and August 30 to Sept 2, 2019. Amount paid for a voucher can be used toward a full rate reservation during the blackout dates. Voucher purchase limit 2 per family and limit 2 vouchers per visit. Must use promotional value in 1 visit. Valid only for option purchased, however lodging/RV Sites may be upgraded with any increase in rate paid at time of reservation Refund for voucher before a reservation is made, only within 30 days from purchase date of voucher. Once voucher is used for a reservation, all lodging reservation cancellations subject to $25 fee, RV Site reservations are subject to a $10.00 fee; 7-day cancellation notice required. If cancellation is made less than 7-days, a penalty equal to 50% of amount paid for voucher(s) apply. However the full value of the voucher remains valid for other reservations within the expiration date. One change to a reservation is allowed with no fee. Each additional date change is subject to a $5.00 change fee. Credit card required at booking and check-in. Must be 18 or older to check in. All Resort policies as stated on www.yosemitepinesrv.com apply to the reservations made with vouchers. We want you to be completely satisfied with your purchase and understand that sometimes a voucher needs to be upgraded or refunded. Refunds for vouchers must be requested within 30 days of purchase date of voucher. Upgrades may be requested at the regular reservation rate with additional costs to be made at time of reservation. CHECK-IN TIMES: 3 p.m. for all Cabins and Yurts, Noon for RV and Tent camping sites. Checkout time is 11.00 AM. Unless prior agreements have been made for an extension, there will be a full day registration fee charged for occupancy past checkout time. For the safety of our guests, all persons visiting in the park must be registered at the office and a visible pass must be in all vehicles. If needed, management reserves the right to move you to another space. DAY GUEST: Campers must register their guest, in advance, to identify persons and guest’s vehicles using the facilities and that a parking space may be needed. A day use fee is charged. SWIMMING POOL: NO LIFEGUARD ON DUTY! – Pool hours are seasonal. Children under the age of 14 must be accompanied and supervised by an adult at all times. Please dry off before entering buildings. Bare feet or wet suits are not allowed in the General Store or Clubhouse. Laundry facilities are located in the clubhouse area. Quiet Hours are from 10PM to 7:00AM. Please, use of generators is not permitted at any time. Motor-driven cycles are to be driven quietly and only to enter and exit the park. Bicycle riding is allowed within the park on the main roads at the 5 M.P.H. speed limit. Please respect others by not riding through sites, occupied or vacant. California State law requires a helmet to be worn at all times. Please keep your site clean during your visit and upon departure. The resort is located in mountain area and wildlife is present. Please keep food properly stored. Treat your trash like food. Keep it in your RV or dispose of it in a dumpster; do not leave it sitting out. Pets are WELCOME, although dogs must be kept on a leash at all times when outside of your Tent, RV or Cabin and you must always clean up after them. Pets are not to be left unattended and must be kept in your unit after dark. Please, no aggressive dogs of any breeds. If your dog shows aggression or is disruptive to other dogs and guests, you will be asked to leave the park. A $25.00 non-refundable pet-cleaning fee will be charged when staying in a Cabin or Yurt for up to two pets. For the safety of our guests, lines of any type are not to be tied to trees, bushes, or any other Yosemite Pines Resort property. Firearms and fireworks are not allowed. All wastewater must be disposed of in a sewer connection or at the sanitary station. Please dump Port-a-Pot at the sanitary station. Washing of RV, Tents or Vehicles, Oil changing or major vehicle work in not permitted on the property. There is a mechanic and a coin-operated car wash within the city. There is a three-day minimum stay required in all rental Cabins/Yurts and RV/Tent sites over the Memorial Day, 4th of July & Labor Day holidays. Clubs and Meetings – Groups and family reunions are welcome! The deli is available for private party rental with the option of limited catering. Or you may choose to rent one of our Picnic Pavilions for you own private gathering. 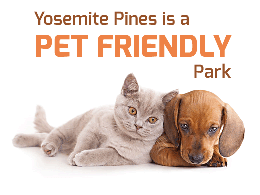 Please inquire at the reservation desk or at www.yosemitepinesrv.com. All campsite or RV Sites fees include up to five people. The maximum number of people in a RV site or campsite is six. Additional person will be subject to a fee of $7.00 per person/per night. Only one RV and one small tent are allowed in a RV site if space allows. Only two tents are allowed in Basic No Hookups Site if space allows. Fires are permitted at campsite or RV site in the fire rings when permitted by the Forestry Department. Be careful – extinguish your fire when unattended. For your convenience firewood is sold at the General Store, please do not cut the trees or shrubs. For Health and Safety reasons, cabins cannot accommodate more persons then the unit sleeps. All cabins and yurts include bed linen. Standard, deluxe, premium, premium loft and luxury cabins include bed linens and towels. All cabins and yurts receive once a week housekeeping service when rented for seven or more consecutive days. There is a limit of 2 pets staying in the cabins and yurts. A fee of $25.00 per stay will be charged. Please read our pet policy . Wood fires are not permitted within 25 feet of any Cabin or permanent structures. Charcoal fires only are allowed in BBQ’s located outside of cabins. We appreciate your help in keeping this a great vacation destination. If you see anything that needs our attention or if you have any suggestion on how we could make you stay more enjoyable, please stop by the office and converse with a staff member. Additional People: All RV Sites or Tent Sites fees include up to five guests. The maximum number of guests in a RV site or Tent Site is 6. Additional guests will be subject to a fee of $7.00 per person/per night. For Health and Safety reasons, Cabins and Yurts cannot accommodate more guests then indicated. Pet Policy: We welcome pets. Total Number of Pets are LIMITED to 2 and if you are bringing pets along, NO aggressive dogs of any size are allowed. A $25.00 non-refundable pet-cleaning fee will be charged when staying in a Cabin or Yurt for up to 2 pets. Rental Units: All Cabins and Yurts have been inventoried. You will be responsible for any missing items or damages to the cabin or yurt. Payment Policy: Advanced payments for upgrades are always paid by credit card. Any additional balance for extras may be paid either by cash or credit card at the property. By providing a credit card number, you are authorizing us to bill your credit card, including any costs accrued while at the property, and outstanding balances not paid at time of departure. Cancellations Policy: Please contact our office, (209) 962-7690, prior to the arrival date to cancel/change reservation. Cancellations for a RV Sites or Tent Sites are subject to a minimum $10.00 cancellation fee. In addition, cancellations made within seven (7) days of scheduled check-in are subject to a penalty equal to s one (1) day reservation fee. Cancellations for a Cabin or Yurt are subject to a minimum $25.00 cancellation fee. In addition, cancellations made within seven (7) days of scheduled check-in are subject to a penalty equal to a one (1) day reservation fee. Please contact the property for cancellations or to make any changes to your reservation. Cancellations must be made prior to the arrival date of your reservation. If cancellations or changes are not made as indicated above, your reservation is subject to a penalty equal to 100% of the total reservation. Our property is advised of impending peril by the Fire Marshall and/or Sheriff. Refunds may be given, at the properties discretion, if the property is under evacuation orders or other danger identified by law enforcement. Cancellation by the guests due to weather conditions including, but not limited to wildfire smoke, heavy rain or snow etc. as sole conditions for cancellation are subject to our cancellation policy fees. Cancellation/change fees may be waived, one time, at the property’s discretion, if adverse weather conditions exist and guests choose a future alternative date. Change Policy: Service charges may apply for changes to your reservation. One change to your reservation is allowed without incurring a service charge; all subsequent changes will be charged $5.00 per change. Lodging Refund Policy: We will process your return to your original form of payment.